When you have food allergies grocery shopping can be a little difficult. You always have to check labels and ingredients. It can get really old! Some things that you will probably be able to eat are fruits, vegetables, grains, beverages, and meats. Anyone, even people who are allergic to soy can eat fruit and vegetables. Plus, fruits and vegies are really good for you! The above picture is what you should look on while shooping. Always look at the CONTAINS part! You should always check the labels. It is crucial to your health and well being! 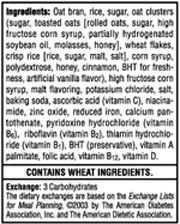 Follow this link to find out more about food labels will say!